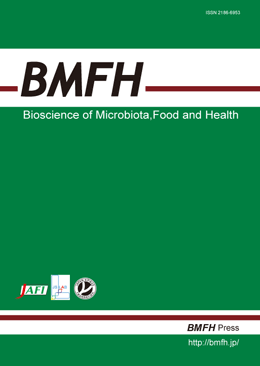 BMFH is a multidisciplinary journal aimed at providing insight into the study of intestinal microbiota, development of probiotics/prebiotics/biogenics, bioscience of lactic acid bacteria, and food immunology and food function. The journal publishes reports of significant results as high quality full papers and notes dealing with advanced research in these fields. Letters to the editor can be submitted to the journal. BMFH also features review articles targeted to broader audience. Bioscience of Microbiota Food and Health is indexed and abstracted in the following media. The editors welcome original papers pertaining to all areas of intestinal microbiota of humans and other animals, food immunology, food function, and lactic acid bacteria.